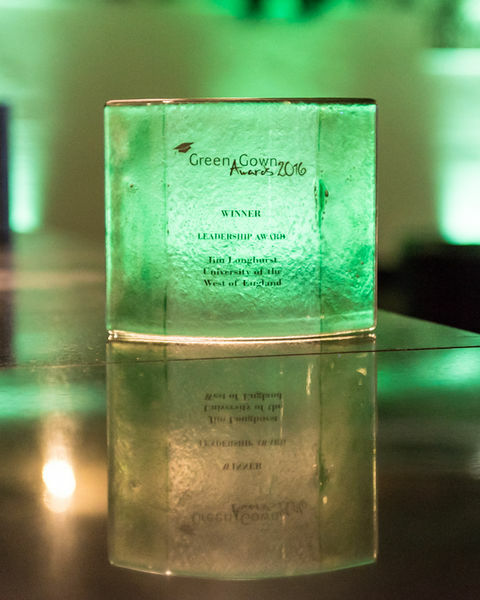 “I have been fortunate to be asked to make the Green Gown Awards since 2009 but my career with recycled glass actually began by accident – quite literally! In 1999 I had a fall at my place of work, badly injuring my back, which resulted in not being able to continue with my job. I had always enjoyed being creative, so I decided not to lie around feeling sorry for myself but to go back to doing what I loved. A part time course in Art and Design led, unexpectedly, to a degree in Contemporary Decorative Crafts specialising in glass at the University of Lincoln. As a mature student this wasn’t an easy option for me as it involved some very late hours juggling Course work with looking after my 2 young children, but I really enjoyed the creative process and was determined to persevere while I had the chance. Initially we used old bits of glass to learn the basics before being encouraged to buy new materials as the course progressed. However, I had always disliked waste and tried to reuse and recycle things where possible so went against the grain and continued to use old glass windows instead. Unlike jars and bottles, old plate glass isn’t recycled and is usually dumped into landfill sites so by reusing it in my work I was doing a tiny bit to redress that situation, plus I enjoyed the effects I was achieving and the idea that they had a history for me to continue in new work. 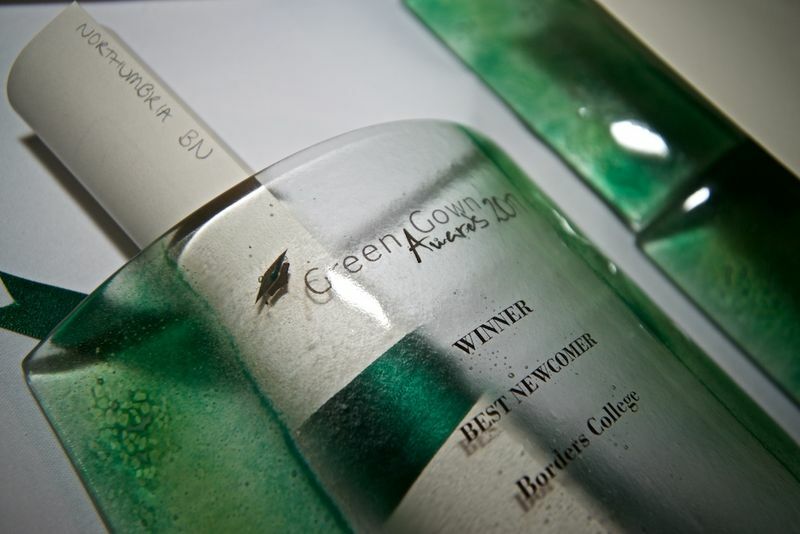 I was delighted to graduate with a BA 1st Class Honors and that, plus my first commission from the final year show, gave me the confidence to set up my own workshop with a creative career using recycled glass. 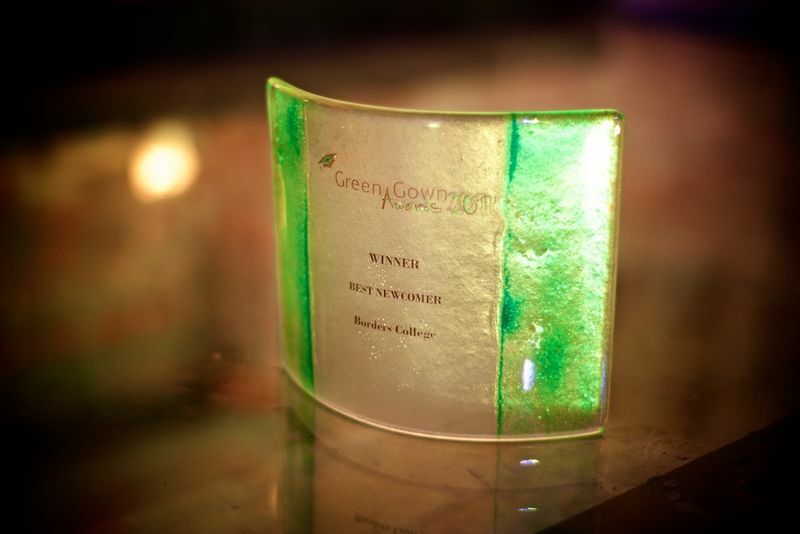 The subsequent commissions for the Green Gown Awards confirmed that I was on the right track. When planning their design, I first looked at who would be winning them and why. I decided to use a mix of green colours to represent the mix of people involved and the many ways of helping the environment. By fusing the colours inside the outer edges of the glass the central area remains clear so that the focus is on the worthy winners. I like the idea that my work is used to celebrate sustainability with like-minded people. Over the years my techniques have developed and improved but the base for all my work is still waste glass. Along with old windows I have ‘rescued’ items such as a 1970’s kitchen hatch, glass partitions from a cruise ship and a black glass panel from a bathroom, to create new and unique items that have gone all over the world. I now incorporate my own drawings and photos with inclusions that are fused into the layers. Due to the extreme heat of the kiln these materials alter in colour and texture so there is always an element of excitement each time the lid is opened to peer inside. By handcrafting each item using recycled materials I know that every piece will be unique. I work from an old outhouse in my back garden - not very fancy but just big enough for me and my trusty kiln. If I'm not in my workshop, I am often out with my camera and sketch book finding new inspiration. I am also a member of a co-operative of artists who look after the lovely old Harding House Gallery on Steep Hill in Lincoln and have a range of my work on display there as well as in other galleries around the country. Over the years I have completed many commissioned pieces both for businesses, Universities and as personal requests, plus I ​help organise and display work in group exhibitions. I also sell many of my smaller pieces in selected craft fairs and events throughout the year. You can find information about these, and examples of my work, on my web site www.abglassart.co.uk and on Facebook page www.facebook.com/ABGlassArt."